Russia’s hybrid military forces attacked Ukrainian army positions in Donbas 47 times in the past 24 hours, with one Ukrainian soldier reported as killed in action (KIA) and six as wounded in action (WIA), according to the press service of the Anti-Terrorist Operation (ATO) Headquarters. In the Mariupol sector, the enemy opened fire from 120mm mortars, infantry fighting vehicles and armored personnel carriers, grenade launchers and small arms on the Ukrainian positions near the village of Shyrokyne. The Ukrainian fortified positions near the village of Vodiane came under fire from 82mm mortars, infantry fighting vehicles, grenade launchers of various systems and heavy machine guns. The militants also used 82mm mortars on the Ukrainian positions near the village of Berezove. The defenders of the town of Maryinka were attacked with infantry fighting vehicles, grenade launchers of various systems, heavy machine guns and small arms, while the defenders of the town of Krasnohorivka, and the villages of Novotroyitske and Pavlopil came under fire from grenade launchers and small arms. Additionally, the enemy fired heavy machine guns on the Ukrainian positions near the village of Hnutove, as well as small arms on the Ukrainian fortified positions near the village of Chermalyk. Enemy snipers were also active near the town of Maryinka. Read alsoRussia uses OSCE car blast for propaganda purposes, attempts to blame Ukraine – media"In the Donetsk sector, the Ukrainian positions near the village of Troyitske were attacked with 120mm and 82mm mortars, grenade launchers and small arms. The invaders also used 82mm mortars, heavy machine guns and small arms against the Ukrainian fortified positions near the village of Verkhniotoretske. The enemy also fired 82mm mortars, grenade launchers of various systems and heavy machine guns on the defenders of the town of Avdiyivka, as well as grenade launchers and heavy machine guns on the defenders of the village of Pisky," the report says. The Russian occupation forces shelled grenade launchers of various types and small arms near the villages of Maiorsk and Novhorodske. In addition, enemy snipers were working near Novhorodske. Read alsoUkrainian soldier killed in attack on Avdiyivka on TuesdayIn the Luhansk sector, the Russian-backed mercenaries opened fire from 120mm mortars, anti-tank grenade launchers and heavy machine guns on the Ukrainian fortified positions near the village of Novo-Oleksandrivka. The enemy also fired 120mm mortars on the Ukrainian positions near the town of Popasna, as well as 82mm mortars, grenade launchers and heavy machine guns on the Ukrainian fortified positions near the village of Troyitske. Furthermore, the defenders of the village of Novozvanivka came under fire from grenade launchers of various types and heavy machine guns, while the defenders of the village of Stanytsia Luhanska were attacked from grenade launchers and small arms. "In some cases, when there was an immediate threat to the life and health of servicemen, the commanders made decisions to adequately fire in response," the press service said. 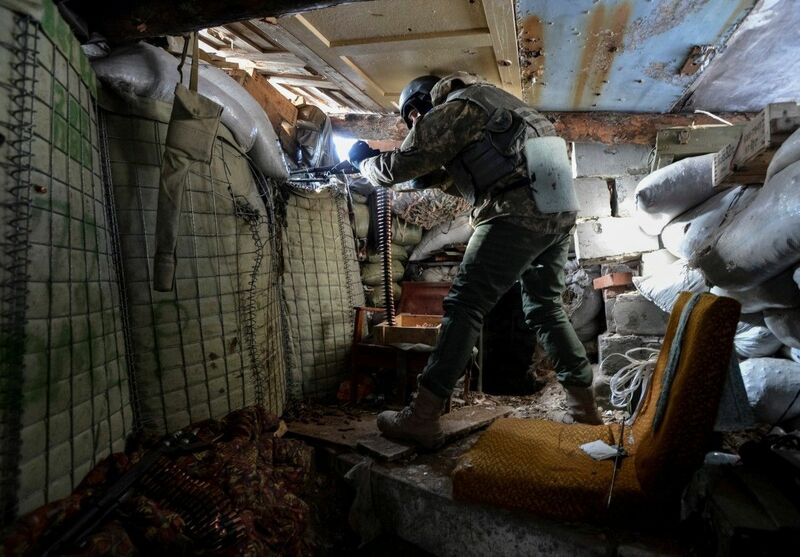 According to intelligence from the ATO headquarters, as a result of an adequate response to the enemy fire, three Russian mercenaries were killed and another seven militants were wounded on April 25-26.